Welcome to the Embassy Suites Palm Desert hotel - where outstanding accommodations and superb hospitality await you in the heart of beautiful Palm Desert, California!Palm Desert is several minutes east of Palm Springs, Hollywood's playground!Guests of the Embassy Suites Palm Desert hotel enjoy their stay in one of our 198 spacious two-room hotel suites, with either majestic mountain or lush courtyard views. 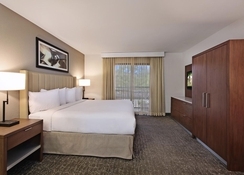 Each of our Palm Desert hotel suites is equipped with a range of amenities, designed to make your stay with us in Palm Desert, CA as comfortable and enjoyable as possible. 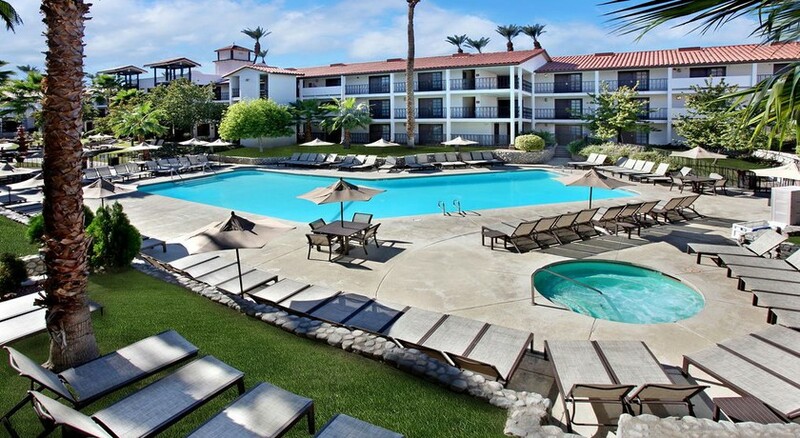 All of the amenities of the Palm Springs desert oasis are easily accessible from our centrally located Palm Desert hotel. 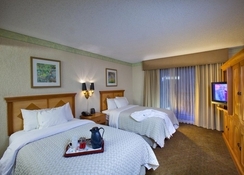 Hotel guests are invited to enjoy:* Two 32" LCD televisions* Refrigerator, microwave oven and coffee maker with complimentary coffee and tea* Two telephones with data ports, voicemail and one with speakerphone* Alarm clock radio with MP3 connection* Well lit dining/work table* Sleeper sofa, armchair and activity table with upholstered chairs* Beautiful 200 thread-count Embassy Essentials? Bedding Collection linen* Exclusive Bloom Energy? 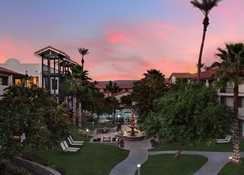 bath and body productsWhile at our Palm Desert hotel, guests are also welcome to take advantage of our hotel-wide amenities and services, inclusive of:	* Large outdoor heated hotel pool with an adjacent whirlpool and spacious sundeck * State-of-the-art Precor? 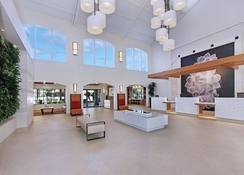 hotel fitness center* Six lighted hard-court tennis courts* High-speed, wireless Internet access* On-site dining* Business CenterIn addition to these amenities, guests are welcome to enjoy spending some time on our 6 hard-court lighted tennis courts. 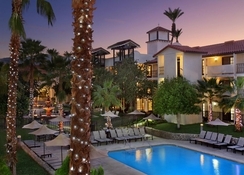 Access to these beautiful courts is complimentary to all guests and reservations are available. 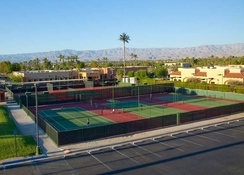 We also have a tennis pro on-site available for private lessons and instruction.